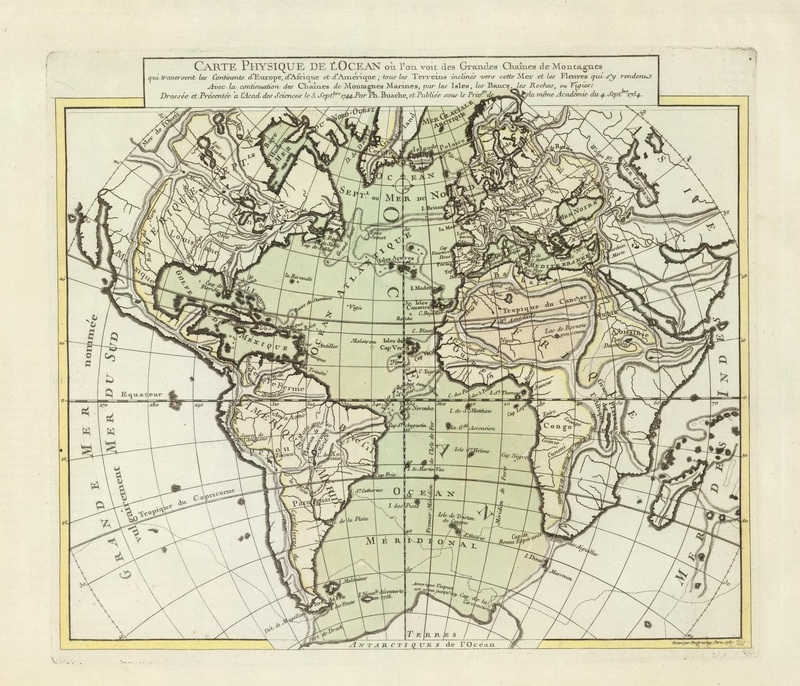 Philippe Buache, Carte physique de l’Ocean ou l’on voit des grandes chaines de montagnes qui traversent les continents d’Europe, d’Afrique et d’Amerique (Paris: G. Delisle et P. Buache, 1757), David Rumsey Map Collection. An exploration of the economic, business, and social history of the Atlantic world from 1450-1800. The course examines developments in Europe, Africa, and the Americas, with special attention to the interactions and competition among the British, French, Spanish, Portuguese, and Dutch empires. Topics may include the economic ideologies that underlay European imperial expansion, technologies of transportation and communication, the economics of slavery, trading encounters with Native peoples, and changing ideas about consumption. Explain how historians studied in this course have contributed to historiographic debates about the Atlantic world and economic history. All readings are due on the date listed in the syllabus. Any reading without a hyperlink will be made available in Blackboard. Th 9/4 What is Atlantic history? David Armitage, “Three Concepts of Atlantic History,” in The British Atlantic World, 1500-1800, 2nd ed., edited by David Armitage and Michael J. Braddick (Houndmills: Palgrave Macmillan, 2009), 13–29. Cécile Vidal, “The Reluctance of French Historians to Address Atlantic History,” Southern Quarterly 43 (2006): 153–89. Jorge Cañizares-Esguerra, “Some Caveats About the ‘Atlantic’ Paradigm,” History Compass 1 (2003): 1–4. Daron Acemoglu, Simon Johnson, and James Robinson, “The Rise of Europe: Atlantic Trade, Institutional Change, and Economic Growth,” American Economic Review 95, no. 3 (2005): 546–79. Hugo Grotius, The Freedom of the Seas, or the Right Which Belongs to the Dutch to take part in the East Indian Trade, translated by Ralph Van Deman Magoffin, Introduction by James Brown Scott, Director of the Carnegie Endowment for International Peace (New York: Oxford University Press, 1916). Eltis, Rise of African Slavery, chapters 1–2. Philip J. Stern, “‘Bundles of Hyphens:’ Corporations as Legal Communities in the Early Modern British Empire,” in Legal Pluralism and Empires, 1500-1850, edited by Lauren Benton and Richard J. Ross (New York: New York University Press, 2013), 21–48. Regina Grafe and Alejandra Irigoin, “A Stakeholder Empire: The Political Economy of Spanish Imperial Rule in America,” Economic History Review 65, no. 2 (May 2012): 609–51. Daviken Studnicki-Gizbert, “La Nación among the Nations: Portuguese and Other Maritime Trading Diasporas in the Atlantic, Sixteenth to Eighteenth Centuries,” in Atlantic Diasporas: Jews, Conversos, and Crypto-Jews in the Age of Mercantilism, 1500-1800, edited by Richard L. Kagan and Philip D. Morgan (Baltimore: Johns Hopkins University Press, 2005), 75–98. David Hancock, “Self-Organized Complexity and the Emergence of an Atlantic Market Economy, 1651-1815: The Case of Madeira,” in The Atlantic Economy during the Seventeenth and Eighteenth Centuries: Organization, Operation, Practice, and Personnel, edited by Peter A. Coclanis (Columbia, S.C.: University of South Carolina Press, 2005), 30–71. Pierre Gervais, “A Merchant or a French Atlantic? Eighteenth-Century Account Books as Narratives of a Transnational Merchant Political Economy,” French History 25, no. 1 (2011): 28–47. Eltis, Rise of African Slavery, chapters 3–6. Eltis, Rise of African Slavery, chapters 7–10. de Vries, Industrious Revolution, chapters 1–2. Brett Rushforth, Bonds of Alliance: Indigenous and Atlantic Slaveries in New France (Chapel Hill: OIEAHC, University of North Carolina Press, 2012), chapter 3. Molly Warsh, “Political Ecology in the Spanish Caribbean,” William and Mary Quarterly, 3rd ser., 71, no. 4 (Oct. 2014), 517–50. Richard White, The Middle Ground: Indians, Empires, and Republics in the Great Lakes Region, 1650-1815 (Cambridge: Cambridge University Press, 1991), chapter 3.
de Vries, Industrious Revolution, chapter 3. Jane Mangan, Trading Roles: Gender, Ethnicity, and the Urban Economy in Colonial Potosí (Durham, NC: Duke University Press, 2005), chapter 5. Gordon DesBrisay, “Aberdeen and the Dutch Atlantic: Women and Woolens in the Seventeenth Century,” in Women in Port: Gendering Communities, Economies, and Social Networks in Atlantic Port Cities, 1500-1800, ed. Douglas Catterall and Jodi Campbell (Leiden: Brill, 2012), 69–102. de Vries, Industrious Revolution, chapter 4. T.H. Breen, The Marketplace of Revolution: How Consumer Politics Shaped American Independence (New York: Oxford University Press, 2004), chapter 3. John Trenchard, Cato’s Letters, or Essays on Liberty, Civil and Religious, and Other Important Subjects, four volumes in two, edited and annotated by Ronald Hamowy (Indianapolis: Liberty Fund, 1995), Letters 2-11. Adam Smith, An Inquiry into the Nature and Causes of the Wealth of Nations by Adam Smith, edited with an Introduction, Notes, Marginal Summary and an Enlarged Index by Edwin Cannan (London: Methuen, 1904), Book IV, introduction, chapters 1-2. Joyce E. Chaplin, “The Atlantic Ocean and Its Contemporary Meanings, 1492-1808,” in Atlantic History: A Critical Appraisal, ed. Jack P. Greene and Philip D. Morgan (Oxford: Oxford University Press, 2009), 35–51. Peter A. Coclanis, “Beyond Atlantic History,” in Atlantic History: A Critical Appraisal, ed. Jack P. Greene and Philip D. Morgan (New York: Oxford University Press, 2009), 337–56. Alison Games, Web of Empire: English Cosmopolitans in an Age of Expansion, 1560-1660 (New York: Oxford University Press, 2008), chapter 3. M 12/15 The End of the Atlantic World? The above texts are all available through the Framingham State bookstore. Additional readings will be found on the course Blackboard site and library e-reserves. Participation is vital to your success in this course. You are expected to attend all course meetings and to come to class prepared. That is, you should have completed the assigned reading, have a hard copy with you in class, and be prepared to participate actively in class discussion through comments and questions. You will lose credit for participation after three absences, except in documented cases for extended family or medical emergencies. These two short assignments will ask students to take quantitative data in readings we have done and reinterpret and/or explain it through a brief essay (250-300 words) and a visual representation. The first will be due on Wednesday, September 17, and the second on Wednesday, November 12. Further details will be distributed the week before each assignment is due. Students will write three brief (250-300 words) reports on articles assigned during the semester. For the first, all students will complete a report based on a reading for Thursday, September 25. Students will write the remaining two reports on a reading of their choice for two of the following dates: October 2, October 30, November 6, November 13, and/or December 11. Reports are due at the beginning of class on that date, and must cover a reading assigned for that day. Details on how to complete the reports will be distributed one week in advance of the first due date. Students will write a paper of 2,000 to 2,500 words (including notes) on a topic related to the economic history of slavery using the Trans-Atlantic Slave Trade Database. The paper will be due on October 27. Students will be required to submit a revised version of the paper on Wednesday, December 3 [updated]. Full details will be circulated approximately three weeks in advance of the initial due date. The final for the course will be a take-home essay requiring students to use a wide range of readings and content from the semester to address key questions about the economic history of the Atlantic world. It will be due on the date assigned by the Registrar, Wednesday, December 17 by 2:30pm. Further information will be distributed approximately three weeks in advance. Any student with a disability or other extenuating circumstances should see the instructor as soon as possible to make appropriate arrangements. It is the student’s responsibility to notify the instructor of any accommodations provided through CASA, including written documentation. Please be sure to check the course website for updates to the syllabus, assignment details, and other information about the course. In addition, be sure that you are properly enrolled for the course Blackboard site. The site will be updated regularly with copyrighted readings, PowerPoint slide shows, and supplementary materials. All students are required to maintain a Framingham State e-mail account, and course announcements will be sent to that address and posted to the course Blackboard site. Please check your FSU account and Blackboard regularly for updates. In order to promote active engagement with the materials, no electronic devices are permitted in class except with the prior permission of the instructor. Students should come to class with a hard copy of the readings for that day prepared to discuss them. All lectures and course materials are copyright to the instructor and may not be reproduced or distributed without written permission. You may not record lectures without prior approval in writing. The academic community is built upon the free, open, and honest exchange of ideas and opinions. In order to achieve such an environment, students need to be confident that their peers are holding themselves to the same high standards. Cheating undermines the reputation of a university’s degrees and violates the trust of all members of our intellectual community. Accordingly, no form of cheating will be tolerated in this course. All students are expected to conform to the university’s code of conduct at all times. Any student found cheating will be referred to the Dean of Students according to university policy. Cheating on any assignment will result in an automatic failure of the assignment and other possible repercussions. use of another’s project or programs or part thereof without giving credit. Submission of a work completed for another class either in a previous or concurrent term is academic dishonesty. In short, plagiarism is not allowed under any circumstances. If you have any questions about whether something might be considered plagiarism, please ask. For more information on Framingham State’s policies on academic honesty and plagiarism, please see the CASA Writing Guide. Federal regulations require that students engage in two hours of work outside of the classroom for each credit hour. For courses at Framingham State, which are four credits, that means that students are expected to work for approximately eight hours per week outside of class.